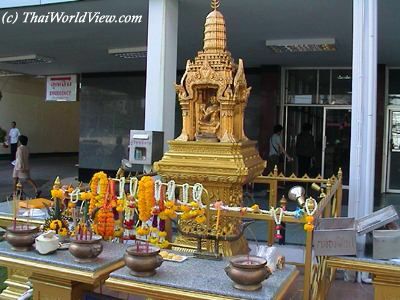 Brahmanism is present in Thailand since the influence of Khmer people starting in the 10th century. 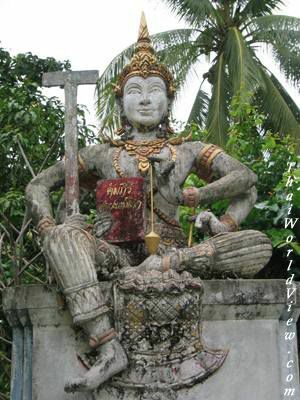 In Thailand, many Brahminic statues can be seen in old Khmer temples. Thai people seized Angkor, in Cambodia, in 1431. 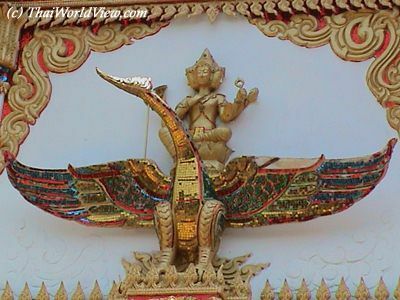 In Thailand, the Lord Brahma (พราหมณ์) representation graces the lintels of Buddhist temples as a supporter and defender of Dharma, or, in mural painting, joining other deities in respectful adoration of the Buddha. Brahmanism was the religion reserved for high rank people. Still nowadays there are some Brahminic priests taking part in royal ceremonies such as the Royal Ploughing (วันพืชมงคล), royal events (marriage, birth, coronation, death, birthday), the cut of the topknot ("CHUK" - จุก). 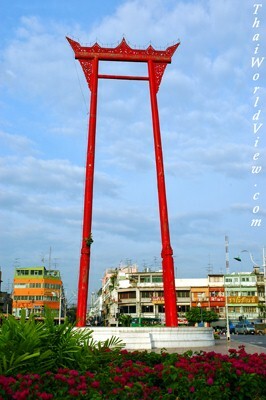 The huge swing (เสาชิงช้า) near "WAT SUTHAT" in Bangkok is a Brahminic symbol. It was closed more than fifty years ago due to mortal accidents. The aim was to go as high as possible in the sky. This Giant Swing was held up to the time of King Rama VII in which four Brahmans used to make swooping area of 180 degrees. Regarding the cut of the topknot ("CHUK" - จุก). The child's head is shaved except for a topknot. This topknot is supposed to keep the child's soul inside the corpse. It cannot flee. When the child is old enough, the topknot is cut by Brahmins. Brahmans are always dressed with white clothes and have knot hair. The Brahmans are using a conch-shell (สังข์) during their ceremonies in order to call the gods. 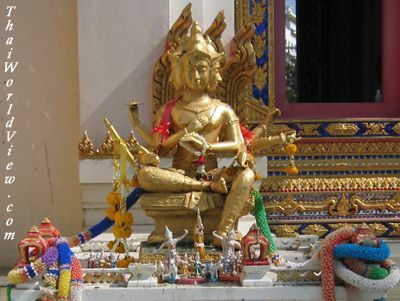 Many Brahma shrines can be found in Bangkok in front of major buildings or on skyscrapers' roof. Presence of the royal white elephants is still a Brahminic presence. The white elephants are supposed to bring luck to the King and the Kingdom. This caused a war to happen between Burma and Ayuthaya kingdom. The Burmese king wanted white elephants living in Ayuthaya Royal court. 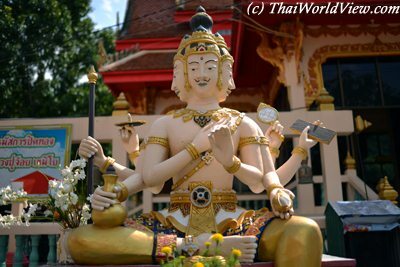 In Thailand, the Lord Brahma images are represented in many places and are highly venerated by Buddhists. Brahma is known for his great boon-giving power. In February 2000 a multi-faith ceremony happened in the Thai Parliament. Buddhist, Christian, Brahminic and Islamic rites were performed one after another. Since the election in November 1996, 8 MP had died and 11 MP had resigned. Those priests were supposed to expelled bad luck from parliament. The Suphanahongse Royal Barge has a huge swan carved into its bow. The swan is the mount of Brahma. The royal barge enforced the image of the king as the equivalent of the trinity of gods known as Trimurti, a symbol that would ensure victory in times of war. Trimurti is the trinity of three gods - Vishnu the Protector, Shiva the Destroyer and Brahma the Creator. The Lord Brahma, the creator, is always represented with four arms.